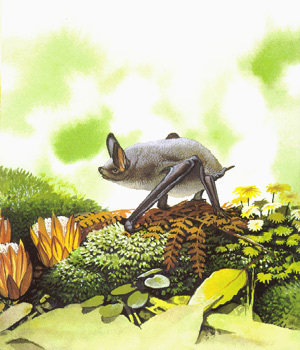 The extinct greater short-tailed bat Mystacina robusta was a member of the Mystacinidae family of the Chiroptera order. 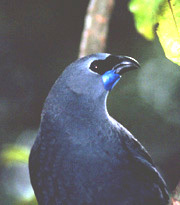 The family is endemic to New Zealand. With its close surviving relative, the lesser short-tailed bat Mystacina tuberculata, the two species were the world's only two bats remaining in the Mystacinidae family. M. robusta, well renowned as very weird and primitive, has been presumed extinct since there has been no confirmed sighting since 1965. The greater short-tailed bat was previously described as a subspecies of the smaller, more predominant M. tuberculata, as recently as 1962 [Dwyer 1962]. 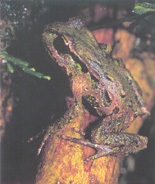 M. robusta was identified as a separate species because of its slightly larger size, and other morphological differences [Hill & Daniel 1985]. Mystacina is the most basal group in the Noctilionoidea, a lineage going back 60 million years. Historical and fossil records from various mainland locations show former wide distribution of the larger M. robusta species throughout the North and South Islands. 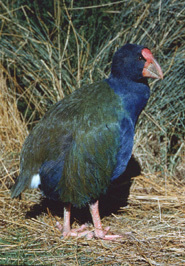 The last sighting was in 1965 before rats infested its only remaining habitat on Big South Cape, and smaller Pukeweka and Solomon Islands, which are part of the Muttonbird Islands group off the South West Cape of Stewart Island. Since Maori settlement in the thirteenth century, the only live specimens came from the Muttonbird Islands when they were rat-free. Short-tailed bats are very unusual creatures. In the prehuman New Zealand ecology, they did the job of small rodents in a normal mammalian ecology. The greater short-tailed bat developed habits that are similar in many ways to New Zealand's flightless and poor flying birds. Little is known about the habits of the greater short-tailed bat, since it is known only from Big South Cape Island and neighbouring Solomon Island and Pukaweka Island. More is known about its close extant relative, the lesser short-tailed bat Mystacina tuberculata because it was more widely distributed, especially in the Central North Island. New Zealand's bats have suffered large declines since human settlement from forest destruction. Selective logging is just as damaging as clear-cutting because bats establish seasonal roosts over long periods of time, probably for hundreds of years in some cases, in mature big trees. Beech trees are particularly favored roosts, but kauri, totara, rimu, rata and kamahi are used. Worthy and Holdaway in "The Lost World of the Moa: Prehistoric Life of New Zealand" suggest that the greater short-tailed bat was prominent in northern New Zealand. Mystacina are not true homeotherms and their body temperature drops when roosting. With the larger body size of the greater short-tailed bat, it takes more energy to get active again, so the warmer climate of the north was more suitable for it. Mystacina are the only bats that scramble over the ground as well as they fly, however, they are relatively slow fliers, and seldom get higher than three metres above the ground. When on the ground the wings are neatly tucked away under a membrane, which allows the use of arms as front legs, to run through burrows and forage on the forest floor as eagerly as a mouse. 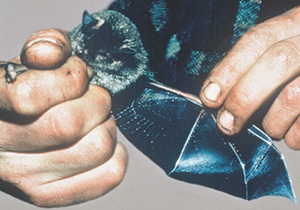 The greater short-tailed bat is New Zealand's largest bat, but relatively small by world bat standards, 90mm in length with a wing span of 300mm. 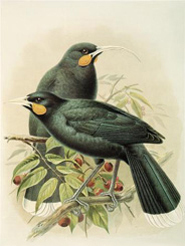 M. robusta was primarily an insectivore, but it is thought to have preyed upon muttonbird chicks in the nest, and has been seen eating the meat of birds that were hanging out to dry. It has been found roosting in petrel burrows. Diamond JM, New Zealand as an archipelago: An international perspective, Ecological restoration of New Zealand Islands, Conservation Sciences Publication No.2, Department of Conservation, 1990. Hill JE, Daniel MJ, An historic record of the New Zealand greater short-tailed bat, Mystacina robusta (Microchiroptera: Mystacinidae) from the South Island, New Zealand, Journal of the Australian Mammal Society, Vol 10, No 1, June 1986. Hill JE, Daniel MJ, Systematics of the New Zealand short-tailed bat, Mystacina Gray 1843 (Chiroptera: Mystacinidae), Bulletin of the British Museum of Natural History (Zoology) 48: 279-300, 1985. Worthy TH, Holdaway RN, Morris R, The lost world of the moa: Prehistoric life in New Zealand, Indiana University Press, 2002. A most historic environmental event occurred in 1964 on Big South Cape Island, and tiny adjoining Solomon and Pukaweka Islands, off South West Cape of Stewart Island. This changed forever the way islands and their native plants and animals are perceived, protected and managed in New Zealand. The islands were the final refuge for a number of native animals formerly abundant and widespread on the mainland and Stewart Island, but which had become extinct on all but Big South Cape, Solomon and Pukaweka. No mammal had been introduced and a full quota of indigenous wildlife was still in place. In the early 1960s habitat destruction and fragmentation had advanced on the mainland, however, there were still hundreds of thousands of hectares of apparent intact native forest. Despite the large area that seemed intact, massive retractions in range and extinctions had occurred. The mainland forests had largely gone silent. But islands such as Big South Cape had not. Extinction of the greater short-tailed bat was a significant loss, because New Zealand's three bat species were the only indigenous terrestrial mammals. Leading biologists firmly believed that ecological collapse was not the result of predation, because predators were natural. As in Europe and North America, the conclusion was that extinction in New Zealand was primarily caused by the destruction, fragmentation and degradation of habitat. This theory was soon to be proved wrong. In 1964 a rat plague on Big South Cape was reported, after ships rats got ashore from a fishing vessel. The rats immediately inflicted immense damage to the last remaining refuge of such rare species as the South Island saddleback, Stead's bush wren, Stewart Island snipe, and greater short-tailed bat. Some respected biologists at the time genuinely believed the rats were not a threat to wildlife, and vigorously opposed the suggestion to intervene. They maintained that intervention would change the ecology in a way that cannot be predicted, and should only be done after research has shown there is a problem. Nevertheless the Department of Conservation eventually succeeded in getting permission to mount a rescue mission, but by the time Big South Cape was reached, five months after the first reports, many land-bird populations had already been destroyed. The saddleback was saved by transferring the remnants to two small neighbouring pest-free islands, but it was too late to save the bush wren, snipe and bat - all of which were quickly exterminated along with an unknown number of invertebrate taxa. It was undoubtedly New Zealand's biggest ecological disaster in modern times, that was quietly forgotten. Copyright © 2011-13 TerraNature Trust. All rights reserved.